Think upcoming action title Bayonetta looks a bit like Devil May Cry? Not surprising as Platinum Games producer Hideki Kamiya was the director for Devil May Cry while at Capcom. It sounds silly to be 'influenced' by your own creation which is Devil May Cry, but I can say that you may find quite a few common features, as my faith towards action games has never changed. However, I did not play DMC1 not even once while developing Bayonetta (I have played about half of DMC4 as part of my research study though). 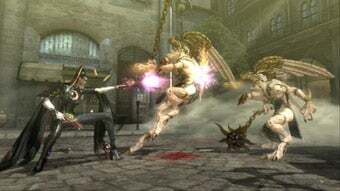 I have deliberately created Bayonetta from scratch and tried to make the game as original as possible, although there will be some similar elements to my previous games in there I'm sure, such is my unchanged faith in developing action games. Anyway, it's been eight years since DMC1, so of course I wouldn't create a game that hadn't progressed from those days! Of course, if there hadn't have been DMC, there wouldn't be Bayonetta, which has evolved from DMC. What's more, if there hadn't been Hideki Kamiya, there wouldn't have been DMC. Or something like that.